I’ve just finished reading Robert MacFarlane’s The Old Ways, a beautiful book, almost a meditation, on the ancient paths – tracks, drove roads and ways – that criss-cross the British landscape. He talks about paths not just as connecters of places, but as keepers of the past, as rights of way – ‘a slender network of common land that threads through our privatised world’ – and as acts of consensual making. He also describes how they offer a way of feeling, being and knowing; they lead backward in history and inwards to the self. The old path, overgrown but I can see it clearly in mind’s eye. It made me think about a path that starts at the end of my lane. We walked it daily when we were young. It cut a safe passage through the hinterland that lay between our row of cottages and the other side. I remember the shade and the mulch and the way it wound its way through a maze of scrubby gorse where sheep hid in thorny hollows. The path, once the main route into Portavadie, fell into disuse a few years back when a better way, a shorter cut, came with the marina development. Everyone followed it instead. How easily, I realised, we’ve let this right of way, this passage of history that holds the tracks of generations, slip from use, sight and mind. So I went to have a look. I stood at the gate that appeared to lead to nowhere. Grasses shimmered silver, copper and purple. Spiky reeds pushed through the mint-green moss. Small white flowers laced the ground. Rhododendrons, exotic beasts, loomed large and shiny. Everything was oversized, pumped up with all the rain. And the place hummed with beasties. Flies buzzed overhead, hazy and lazy in the afternoon sunshine. Bees disappeared up the big pink foxglove bells. Butterflies rested on bristling purple thistles, then rose, like scraps of tissue, whirling up and off into the sky. Without common use and care paths soon disapear. 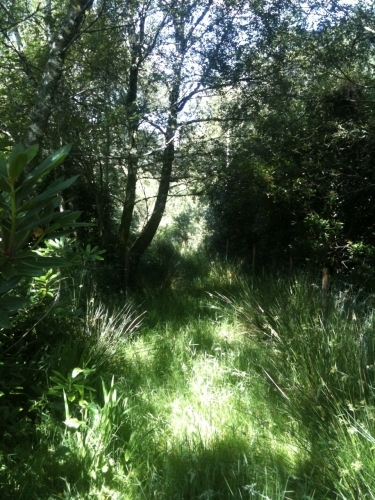 I pushed my way through the undergrowth, forging a path where I remembered the path to be. The further I walked the more impenetrable it became and about half way through nature began to close in around me. I was hot and itchy and this place – part bog, part scrub, part wood – without its path was unwelcoming, uncivilised, unknown. I imagined ticks and adders lurking. Then I hit a wall – higher than me – of bracken, furling and fierce. As I stood facing it, something barked from the undergrowth – a low, raspy, rough sound. It barked again, nearer and more insistent. I heard a sharp cry from a circling bird of prey. I felt a nip on my arm and looked down to see a cleg squatting, flat and dark, sucking. I passed the gate to the path today. 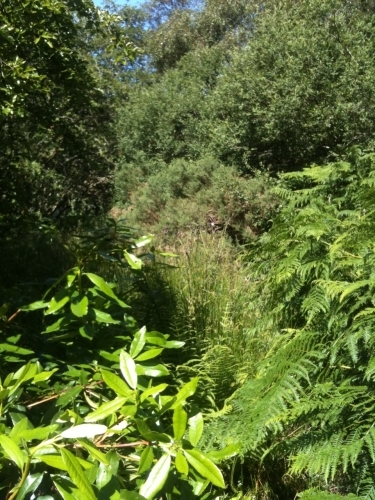 I looked down through the trees and the grass and the ferns, remembering the wild world in there. I thought about retracing my steps, about making tracks and bringing the old path back to life. But I decided to leave it as it is, bound and swathed, but not erased, by vegetation, by the tangle of trees and time. I know it’s there. It carves it ways through my mind and memory and perhaps that is enough.